I’ve written and published two books so far in my life. There are more floating around under my tightly knotted headscarf; this piece of fabric not only keep my brains warm in the damp chill of yet another grey winter in Denmark but to also give me a mini facelift and a pleasingly “startled”, as opposed to “saggy”, look that lovely Ava Gardner once recommended as a cheap beauty trick. This headscarf/bandage/turban has another purpose too; it says to my grey, black and pale pink-clad neighbours and the inhabitants of the small, grey, homogeneously white and affluent town where I live in Denmark that I am different. I don’t give a damn, I’m foreign, wise, proud, funny and about to use it. Perhaps as a British woman, my timing may seem unusual. As the tolerant country that I once knew implodes, divided and in confusion over Britain’s place in or out of Europe. But I am foremost a European and will sweep my own doorstep and lead the life that my headscarf suggests – that of a European eccentric, if not as an English one abroad now that I’ve felt obliged to apply for Danish citizenship. On this grey day in Copenhagen, when we are part of a cloud and the fine rain strikes you from below and permeates on all sides, my turban sits tight and dry in the warmth of the little gallery in Frederiksberg where I’m exhibiting the illustrations which accompany my latest book, Middle Distance. Candlelight flickers, I sip a large ginger shot which I had lovingly prepared for all the curious hoards who would visit the exhibition this week, intrigued by my relentless Facebook, Instagram, Eventbrite, newspaper, and AllEvents.in campaigns about my pictures and my beautiful book. But the hundreds of visitors that I imagined didn’t quite make it, only a few handfuls of sweet and loyal friends who remain by my side, supportive as ever, even though the subject matter has changed so dramatically between the covers of my two books – Rice Pudding In A Duvet, and Middle Distance. 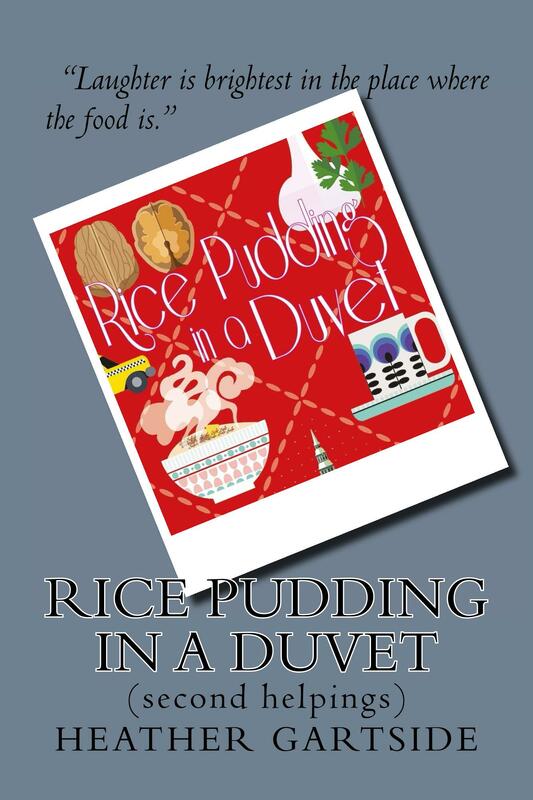 Rice Pudding In A Duvet was published, those loyal friends which I mentioned earlier (you know who you are!) were badgered and spammed endlessly by me to purchase the book in a year-long campaign reminiscent of a Tupperware party, and normal life continued in that small Danish town. There were those normal niggles that we get when approaching mid-life, the mid-life crisis I think they call it. I was chomping at the bit; finding the provincial town too small, my life too boring, my bum too big, the house too small, not enough travel and getting sick of waking up next to an increasingly old looking man. I’d lost my sense of contentment. My husband too was busy having his male menopause and getting stressed; looking to his friends who had more money, more scientific papers published, better cars, a summerhouse by the sea, one in the sun – he’d lost his sense of happiness as he woke-up once more to his next to his increasingly old looking wife. We were arguing more, not nasty loud rows that would upset the kids, but sharp comments, fewer kisses, less time spent together – less joy. WARNING – YOU MUST BE CAREFUL ABOUT WHAT YOU WISH FOR! Christmas came and went, it was nice in a boring way. I continued feeling dissatisfied at my lot, my husband continued getting stressed, eating stupidly, and doing either no exercise or too much. Then, one January evening four years ago “BANG” he fell on our family sofa, had a massive heart attack and died. My first thought was, “No, I never wanted change to happen like this!” – but then you never get to chose the package in which your wish arrives in. Then, frantic resuscitation with the help of those happy children with their golden childhoods – childhoods which effectively ended there. And a miracle happened, and he came back to life and my second novel, Middle Distance began. Now, that could have been the ending of the first novel, but the contrast from the happy valley in which we had frolicked, to the state of emergency we were plunged into, was too intense. There followed many days, weeks, months, then years of recuperation, where my strong husband beat all the odds set so heavily against him for a full recovery. How good is that! But the plot of Middle Distance is all about an unnamed woman, who struggles with the traumatic aftershocks of a devastating accident, and who descends into a sepia-tinged underworld of unacceptance of the change that had been thrust upon their family. A woman who pined for her old life, for the boredom of normality, for the innocence that she’d lost and for the loss of the man that she used to know. So I searched for an ending, and the quest began to regain a sense of contentment by being handed the biggest key, and that was something only that a journey into the soul could find. Here’s a great review of the book. P.S. The next book is in full colour!